How is this system topological? I don't see a schematic representation of the strings. It looks like the paragraph is mixing Sanz's tablature and an "italian alphabet" system. How is the alphabetical notation mapped to chords? e.g., C seems to be mostly D major but once it's A major. Also, where is the rhythmic information? Yes, this paragraph is about Sanz' influence on both tablature and symbolic chord notation. It does not imply that both things are necessarily combined. In fact the example shown on the same page does not show chord notation at all, but it does feature a representation of strings as described. 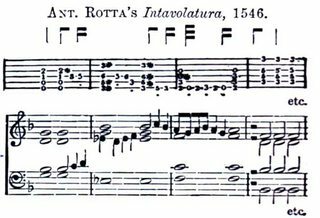 There is no clear relationship between italian alphabet notation and musical pitch notation, and the choice of chord symbols appears to be arbitrary (see this article). 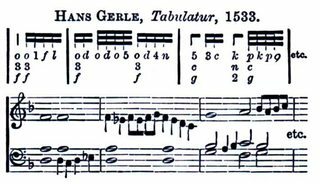 -- The Wikipedia example shows rhythm indicated by small notes above the tablature staff. Note: that's an error on the wiki page. C indeed refers to a D chord, not an A. The Wiki article has a link to the Biblioteca scan of his work. Book 1 is mostly strummed using the alphabet notation. 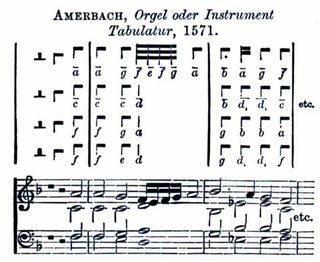 Page 27 & 29 has a table matching the letters to tablature. www.donaldsauter.com/gaspar-sanz.htm discusses his tablature, and renders Book 2 in modern tablature. On the tablature, rhythm is indicted by notes above the score. They are also on the strumming pages, but more compactly. Not the answer you're looking for? Browse other questions tagged guitar notation tablature baroque-period or ask your own question. What does this tablature notation mean?